[Aponogeton distachys] also know as wateruintjies, fill the ponds and dams in the Western Cape with pretty white snowdroplike, strongly scented flowers. 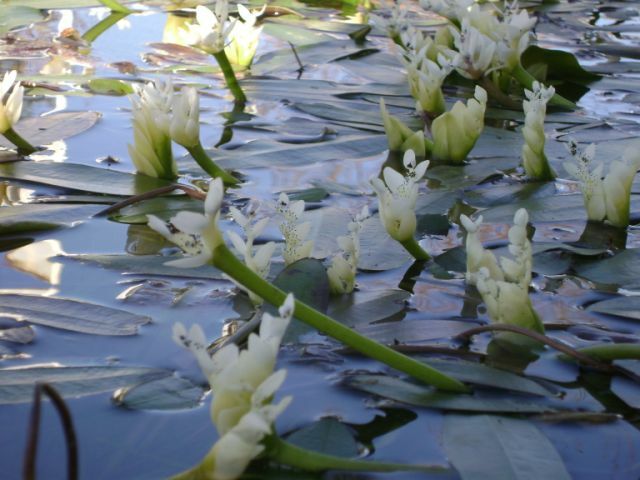 Louis Leipoldt, in his book on Cape Cookery, refers to them in English as Water Hawthorn and Myrna Robins, well known South Africa cook book writer, calls them Water Hyacinth. It is important that the flowers be just opening with the calyces still bright green. To prepare them, remove any of the black centres of the flowers. They need to be soaked in lots of salted water and then rinsed through well in a couple of basins of freshly drawn water. I have found it best to use a combination of thick rib – which adds a little flavourful fat to the dish – and lean shoulder. Many of the old Cape recipes, advocate using “a bit of sheep’s tail to add a bit of fat”, and others recommend “nice fat leg of lamb”. Season the meat with sea salt and freshly milled black pepper. Dip it in well-seasoned flour. In a heavy bottomed ovenproof casserole with a tight fitting lid, brown the meat in batches keep the temperature high. Keeping the browned meat aside on a plate. Adding more oil if necessary, gently fry the onions in the oil and as they start turning golden, add the chili flakes and ginger and continue frying until golden. Remove and drain on kitchen paper. Place the garlic bulbs face down and fry till light gold, remove and drain on kitchen paper. Add the red wine and boil till it has almost all evaporated. Return to the casserole the meat [with any juices which may have collected on the plate] and onion mixture in layers with the waterblommetjies . Season well with sea salt, freshly milled black pepper and add the allspice berries, cloves and nutmeg. Add the stock and bring to the boil and give one stir. Place a cartouche of kitchen paper on top of the stew and put the lid on top and braise in a 180C oven for 1 hour. After an hour, bring the potatoes to the boil in a pot of hot water and boil for about 3 minutes. Remove the cartouche, place the potato quarters on top of the meat and push them down into the sauce. Return to the 180C oven for a further hour or until tender. When ready to serve, stir through gently and serve with steamed white rice and wedges of lemon.